Most famous yacht cruise to Baga beach in Goa. It’s one of the most happening beaches on the coast. You'll find everything from water sports to fine dining restaurants there, along with a pulsating nightlife. Baga beach is located in North Goa, 9 kms from Mapusa and 16 kms from Panaji, the state capital. It's bordered by Calangute beach to the south, and Anjuna beach to the north on the other side of the river. Baga Beach starts right where Calangute ends, although it's hard to pinpoint exactly where. The weather at Baga is warm throughout the year. Some winter nights can get a bit chilly from December to February though. Water sports are a huge attraction. You can go para sailing by yacht cruise or speed boat. There are many things to do for honeymoon holidaying in Goa. Many are simply content lazing on the sun lounges in front of the beach shacks all day and feasting on a steady supply of food, beer, and cocktails. The Wednesday flea market at Anjuna beach and saturday night market at Arpora are both close by, and will satisfy even the best shopaholics. Baga is well known for its nightlife. Head to hip cocktails and dreams to try an astonishing variety of cocktails and shooters, and be dazzled by barmen with impressive flame juggling skills. 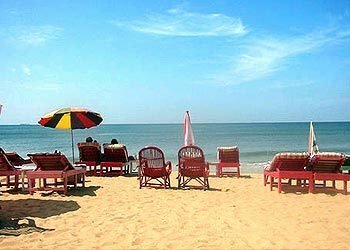 Baga Beach is just a beautiful rocky beach the wonderful natural surroundings and the idyllic ambience make Baga beach and honeymoon holiday destination in Goa.